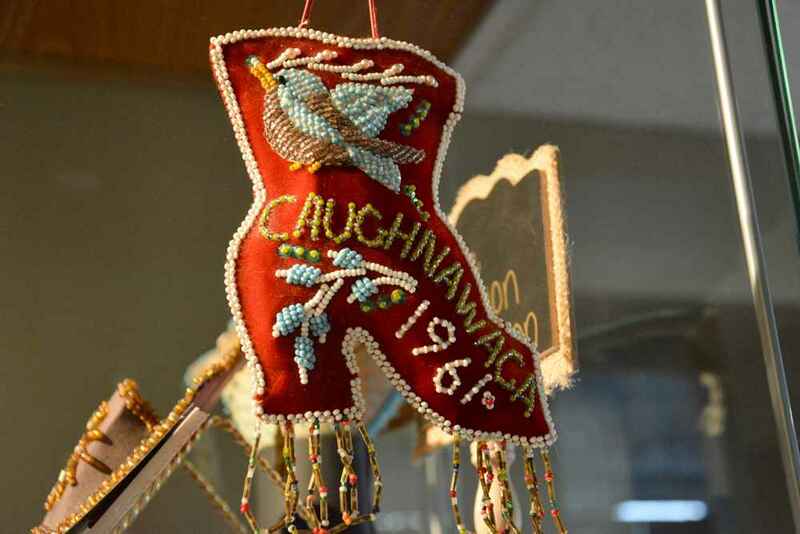 Hundreds of beaded “whimsies” are on display throughout the hallway of the Kanien’kehá:ka Onkwawén:na Raotitióhkwa Language and Cultural Center as a part of a new exhibition. Over a dozen Kahnawa’kehró:non contributed work to the exhibition – either a part of private collections they’ve acquired over the years, passed down from generations, or more recent works on the old tradition. Some of Chellie Goodleaf’s private collection can be viewed in a large glass display. “It’s from a museum – it was an auction of their surplus of their Iroquoian beadwork. These were some of the pieces,” said Goodleaf, pointing various pincushions on display. 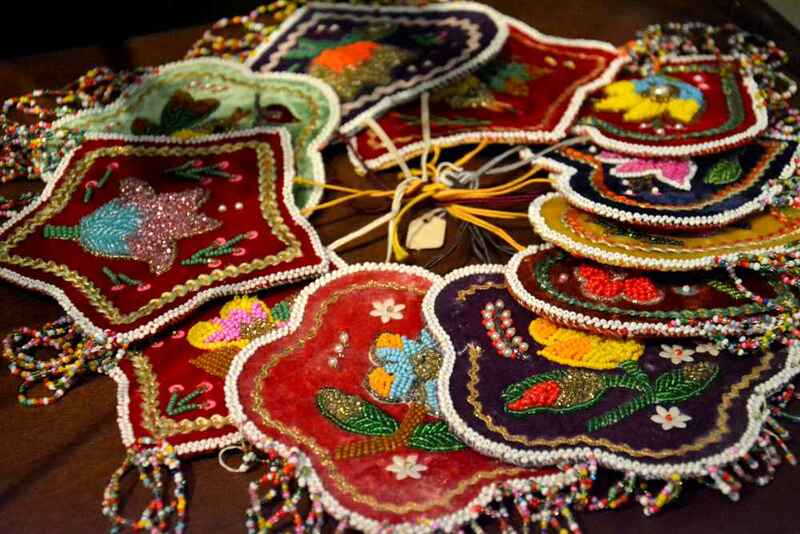 The display is just a small part of her collection of traditional beading. “I have Glengarry caps from 1800, purses from 1840 to 1910, those big beaded pillows – I have seven or eight of them,” said Goodleaf. Goodleaf and fellow historical beadwork enthusiast Caroline Taylor were examining the beadwork while The Eastern Door stopped by the exhibition’s opening on Wednesday evening. “We’re just trying to identify some of them. We’re looking at the beads. The Tuscarora worked with very small intricate beads, so usually you can tell right away if that’s Tuscarora,” said Goodleaf. Goodleaf said the larger pincushion in the shape of a boot with white beads sewn to a purple material, was mostly likely made by a Kanien’kehá:ka. “We’re known for the boots,” said Goodleaf. The two examined the pieces looking for specific types of beads that give an indication of when the item was made. 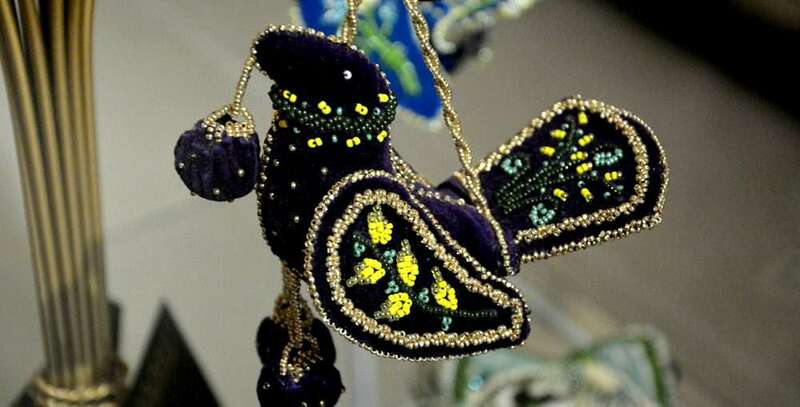 According to Gerry Biron, a Vermont-based artist and independent research of historic beadwork, beaded pincushions and other whimsies became popular during the Victorian period. 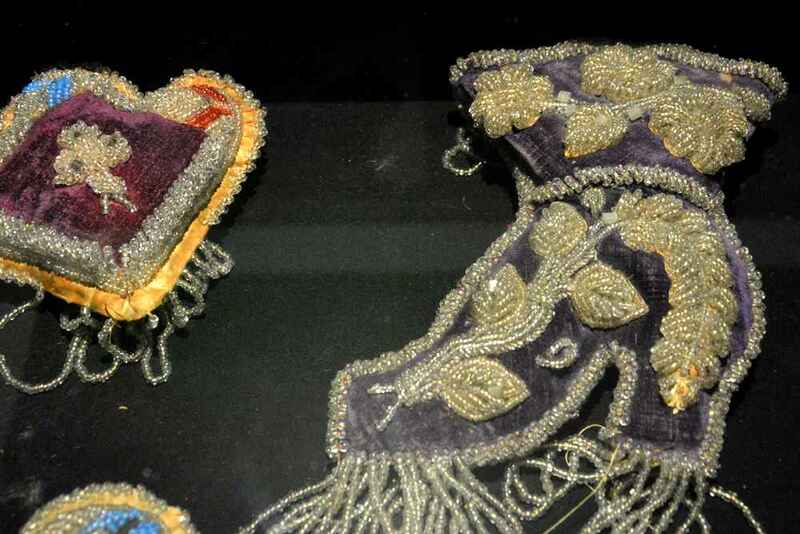 “Victorians loved to embellish their homes with unique and exotic items and their parlours or living rooms were the perfect setting to display their collections,” Biron wrote on his Historic Iroquois and Wabanki Beadwork blog. Haudenosaunee and other First Nations in Northeastern Canada and the United States made the fanciful items in abundance between 1890 and 1930. The “whimsies,” also sometimes called “gee-gaws” or “tourist art,” were often sold around tourist destinations such as Niagara Falls as souvenirs. 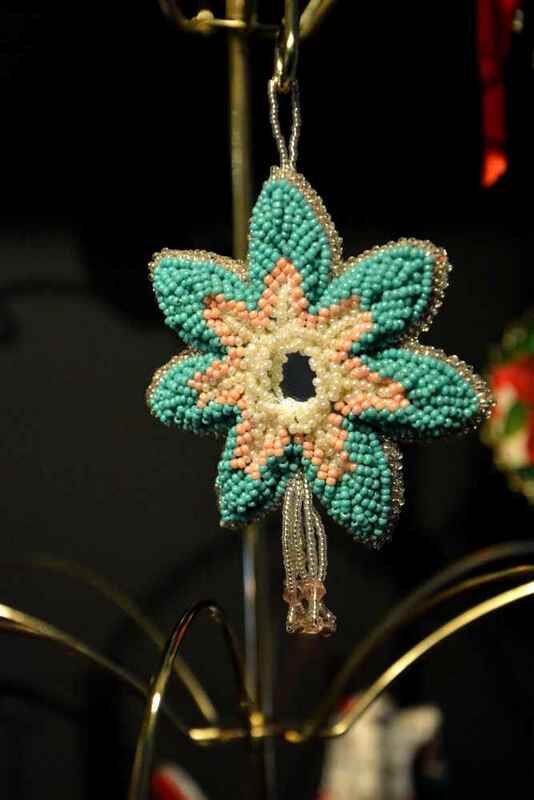 Common shapes of the beaded souvenirs were often pincushions, birds, whiskbroom holders, canoes, slippers, boots, match holders, picture frames, wall pockets, watch holders, and horseshoes. Many, like the ones displayed at the Cultural Center, are decorated with dates, aphorisms, flowers, or all of the above. 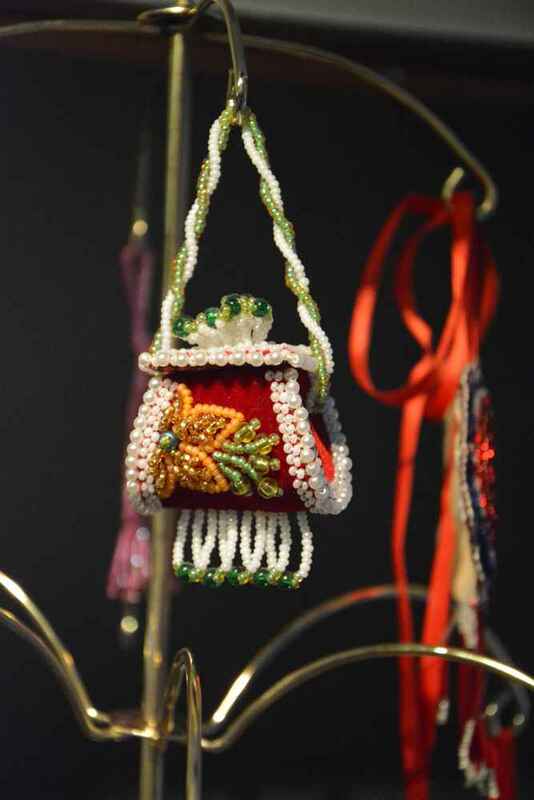 Today, many Kahnawa’kehró:non still carry on the tradition of beading whimsies. 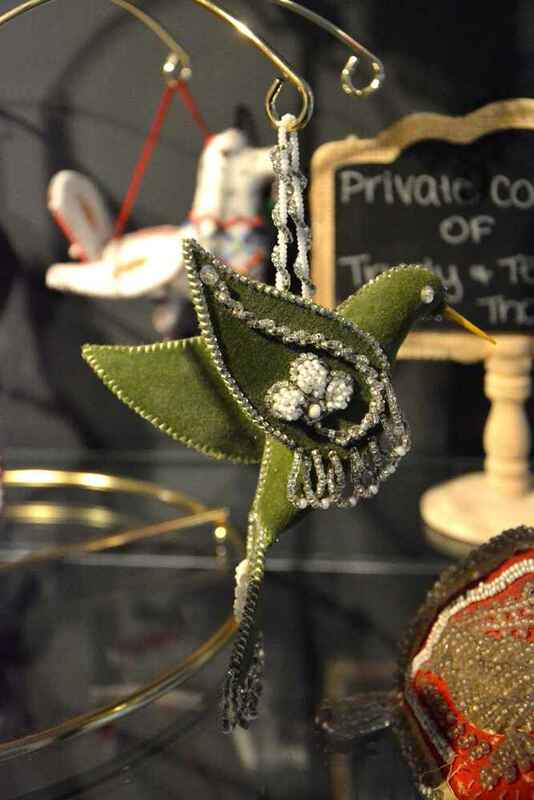 KOR’s exhibition features a number of recent work, including a handful of beaded birds by Taylor. “The big burgundy bird I did with a course from Pauline Lahache – that was the first one I’ve ever made,” said Taylor. She also has a star-shaped pincushion with an intricate design on display that she recently completed. “So, I gave them all the stuff to make it. So, we all had the same exact thing, but they came out totally different,” said Taylor. The exhibition runs until April 22 as a part of the fifth annual Cultural Awareness Month.